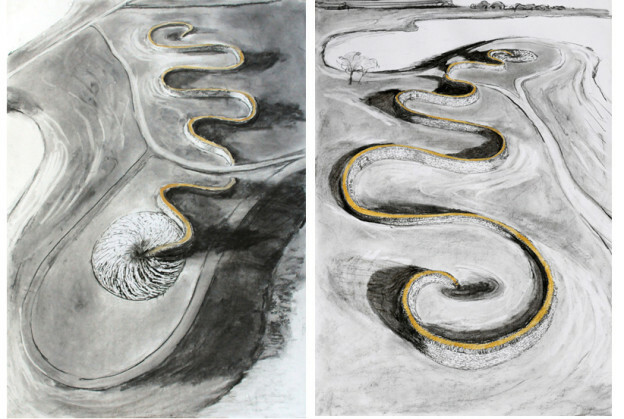 In my work context is everything: context gives rise to process, form and material. Context is very often a balance of nature and culture, or even my cultural response to nature, but it could just as well be a response to something read, a remark by a scientist or as a result of research into some aspect of our lives. More often it is a response to place. The context here is Antarctica (2006-7) – the experience of vast nothingness – ice, light and wind. There is no cultural history here, so in response to nothingness, I decided to impose a vast ephemeral, schematic, science- based drawing of the wind made with a skidoo on fresh fallen snow with the aid of a GPS. The work itself lasted a few hours until a rising wind blew it away; its material therefore is a photographic print of variable scale. The context here is science in Antarctica and the remark made by a scientist about these echograms. An echogram is an image made in a computer by bouncing radar from a small plane, down through the ice to the landmass beneath and up again into a computer. The resulting image is a cross section of the ice and land beneath the flight of the plane, which contains a visual history of 900,000 years of ice accumulation, while revealing whole mountain ranges the size of the Alps buried in ice. This is a slice of a vast slow moving frozen river, sliding inexorably towards the sea at a rate of about a metre a day. 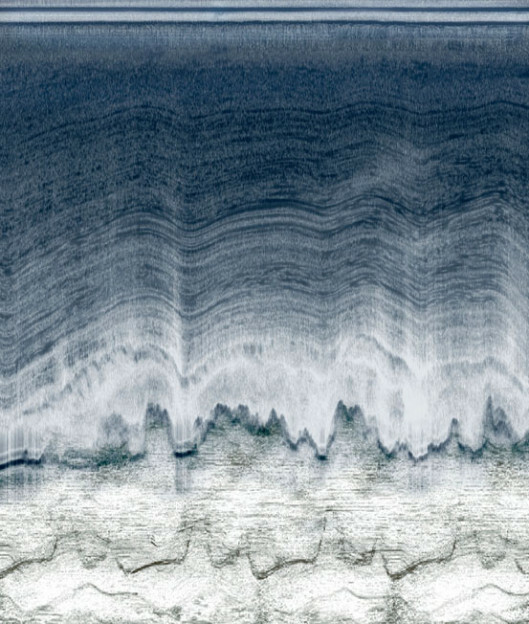 When showing me these remarkable images Hugh Corr from the British Antarctic Survey remarked: ‘This is like the heartbeat of the Earth.” My response to this was to have an echocardiogram of the pilot’s heartbeat conducted at a hospital where I was doing some research. An echocardiogram is a technology similar to an echogram, only bouncing sound waves through the human body. The resulting computer based print is the superimposition of pilot Dave Leatherdale’s heartbeat onto the heartbeat of the Earth. While I was in Antarctica, I was offered the chance of co-piloting a flight from Sky Blu to the Ellsworth Mountains, the most remote range of mountains on Earth. 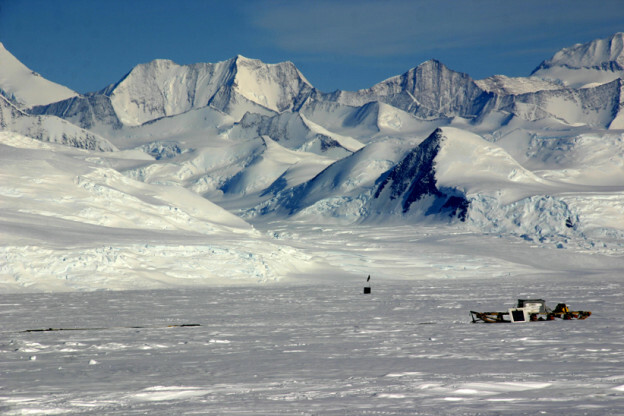 There were a handful of scientists working out on the Rutherford Glacier. I was only there for a morning, but one of them mentioned that a protobacteria had been found on the rocks of Mount Vinson. 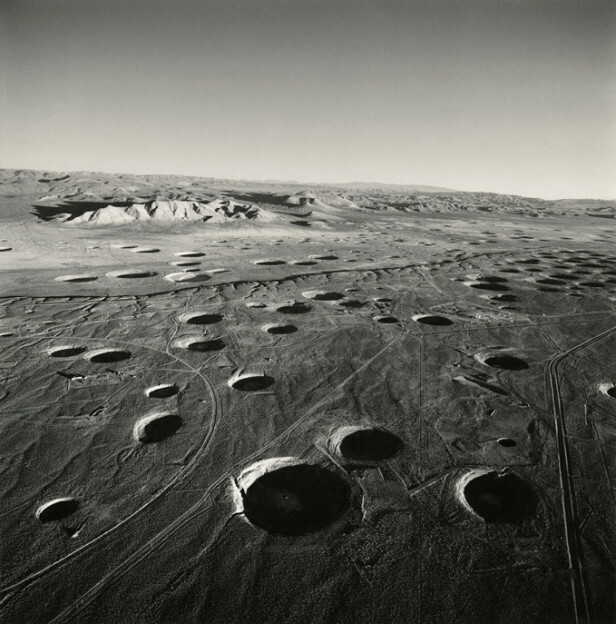 It struck me that here was an organism surviving in the most hostile environment on the planet, and so began a series of works about life in the field of death. The gene sequence for this unnamed organism is stencilled in earth gathered in Antarctica. Lynn Fenstermaker also did some research on me before our meeting and she saw that I was interested in both the microcosm and the macrocosm. 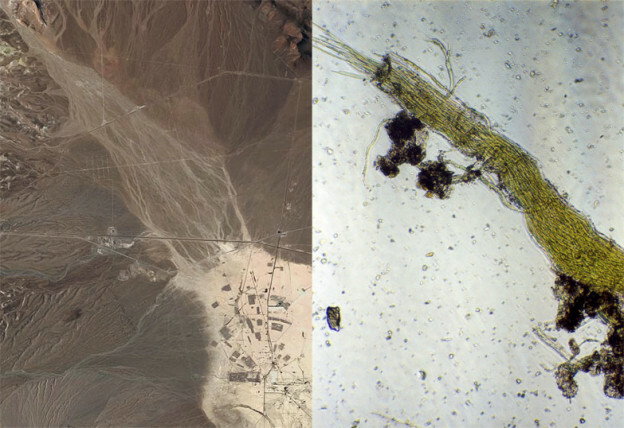 She found a microscope image for Microcoleus vaginata and compared that image to an image from Google Earth of Frenchman Flat – the dried up river system where these bombs were exploded. Not only do the images look remarkably similar, but this single cell cyanobacteria which is found in these soils is also related to the first plants on earth which, 3 billion years ago, found a way of turning C02 in to oxygen and so paved the way for life on Earth. 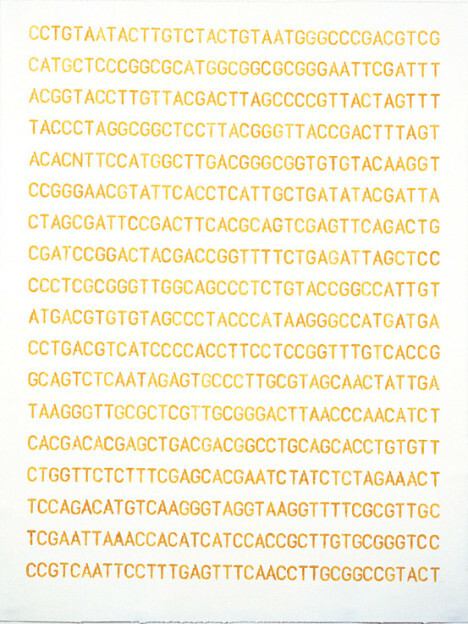 This binary image became a work in the show, together with the gene sequence, stencilled in Test Site earth on the walls of the museum and a primitive fallout chamber made from the same number of rocks as the gene sequence. Context gives rise to form, method and material. The context here is again the Nevada Nuclear Test Site. Mushrooms feed you, kill you, cure you and alter your mind. They break down dead matter back into soil on which new life grows, therefore they represent life, death and regeneration. So this was to be a show about the use and abuse of land in Nevada, which has a history of genocidal destruction of native cultures and their lands. A Shoshone hunting ground the size of Yorkshire was taken for the Test Site where over 1000 nuclear devices were exploded before the Test Ban Treaty in 1963. The land is still used for testing other insidious weapons. The recycling aspect of the mushroom, however, hints at redemption through destruction, because new life regenerates from the death of the old. We seem a long way from that at the moment. The process arising from the context here is one of stringing some 6000 sage bundles between a prearranged pattern template of hooks above and below the work. 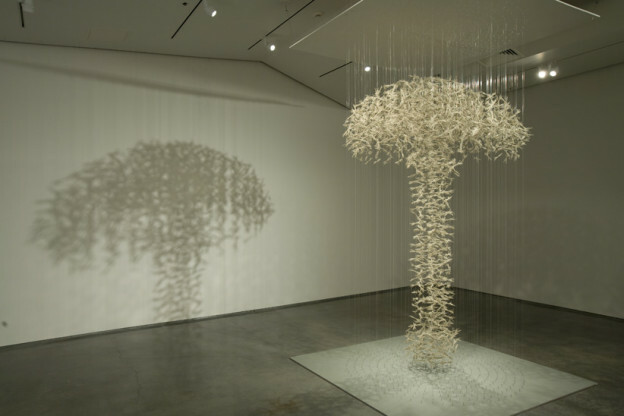 The sagebrush was gathered from the surrounding desert, tied into bundles by teams of helpers and strung into the form of one of the most poisonous fungi on earth: the aptly named Destroying Angel – Amanita virosa. 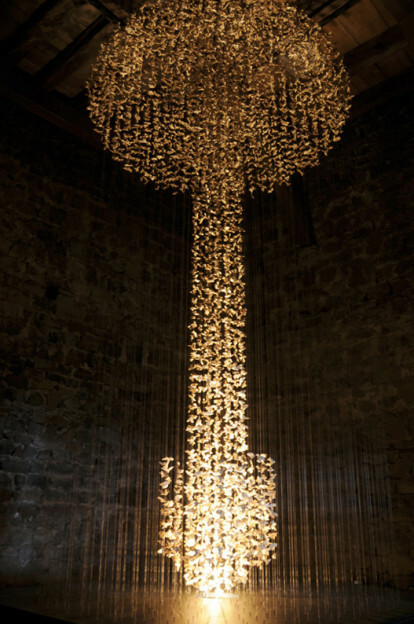 Later (2012) in a tall, stone, windowless room in a castle in Switzerland, I made Mushroom Cloud, using thousands of strung shitake mushroom slices, but this time using one light source underneath to give this rising wave form an explosive charge. The context here is the dying Forests in the Rockies and a 2011 commission for the University of Wyoming in Laramie. The University of Wyoming is entirely financed from the taxation of coal and oil extraction in the state. The University and Faculty is financed by Big Coal. Students get a free education based on the sale of this coal which is shipped out and burned for energy production elsewhere. 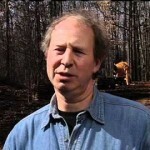 The resulting rise in CO2 worldwide gives rise to a warming climate. The winters here are no longer cold enough to kill off the pine beetle, with the result that the forests in The Rockies are being eaten alive and are dying. The form and material of Carbon Sink is a whirlwind (of destruction) made from beetle-killed pine logs interspersed with coal. Both these materials were once living trees and died during times of climate warming. 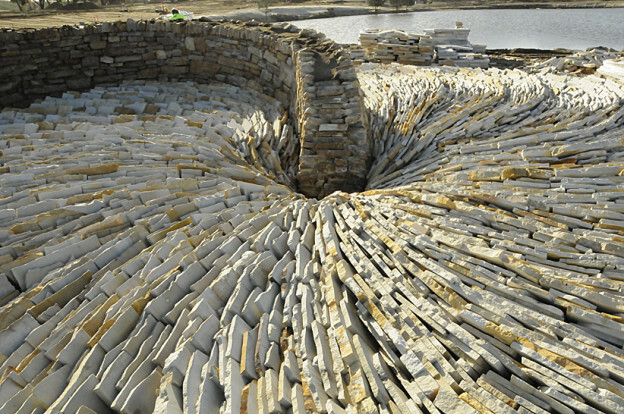 The work plunges into the earth, suggesting the title Carbon Sink. 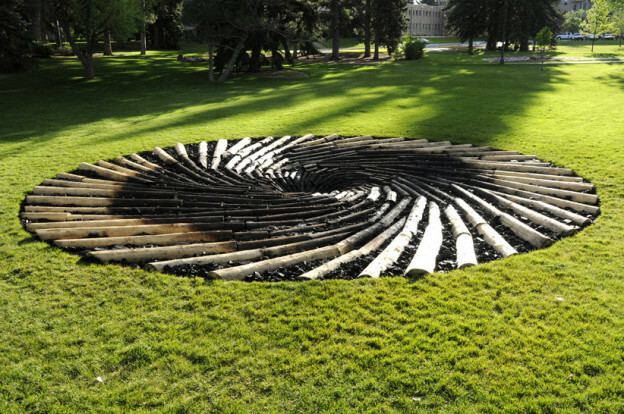 The resulting furore created by the Coal Board and State politicians following the installation of this work on the lawn outside the Dean’s office, went global within 3 days. The politicians under pressure from Big Coal threatened to withdraw funding from the University, thus contradicting the constitutional right to freedom of speech and hobbling an educational establishment’s ability to talk about globally important issues. Two years later, under pressure from both the Coal Board and the politicians, the University quietly dismantled the work. There was uproar from students and faculty and once again the story went global. This was a commission in 2016, from The state of Western Australia to make a land work near the site of the new Perth Stadium on the south bank of the Swan River across from the city. 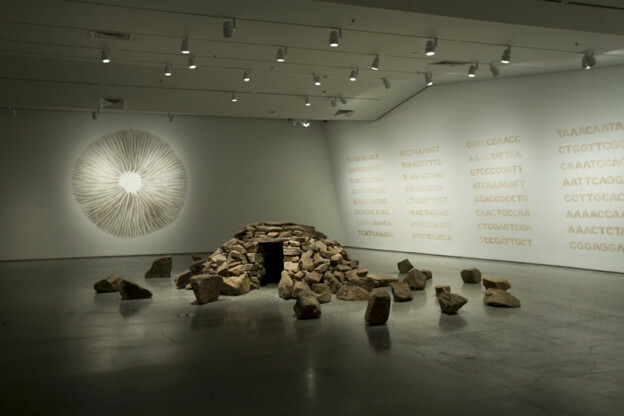 The context is a deep Aboriginal cultural connection with how land comes into being. The site was of significant cultural importance for the Whadjuk people. For them it had been a gathering ground for the river crossing, and a clam fishing point on a wetland. The dreaming creation myth for the Whadjuk people is the Waugal, a huge serpent creature that formed and continues to form the land. This powerful emerging serpent canyon, seen from Google Earth, suggested that the work be a long serpentine form emerging from and descending back into whirlpools. In order to restore some biodiversity to land, which had been wetland and then a rubbish dump, I designed a 200 metre long serpentine Cornish hedge. Traditionally these hedge-walls are in-filled with earth and they grow. Using local stone we designed an irrigation scheme with indigenous planting, which would withstand the heat and drought of the summer months and which would become habitat for small reptiles, insects and birds. I brought three Cornish hedgers over to make the wall, which they did in 3 weeks, shifting 600 tons of rock. Mining of uranium, copper, iron and coal on indigenous lands is driving the economy of Western Australia. As a result, the water table is falling, the land is slowly drying out and dying and with climate change, the dominant culture could well collapse some day. Then the land will revert to wetland and the Waugul will once again have dominion.